Summerside (2006 pop. 14,500) is a Canadian city in Prince County, Prince Edward Island. It is the second largest city in the province and the principal municipality for the western part of the island. - Source: Wikipedia: Summerside, Prince Edward Island. The flag of the City of Summerside has a navy blue field, with a device in the centre nearly the full height of the flag. Outlined in white, the overall device is a naturalistic depiction of an architectural upper story gable in white with black details. In its upper triangle, against a brown background, are a cannon and shot in black, with a clock tower in green with black details and the clock in grey and black above. Enclosed by the gable is a coastal scene. Blue water forms the lower half, with a partial shoreline in green and brown at the left. A light blue sky forms the upper half, with a large white cloud at the left. In the centre is a two-masted square-rigged ship, under full sail, oriented toward the fly, with white sails and a black hull. Below the gable is a fishing dory in olive green with brown details, with a wheat sheaf above the bow and a blue heron above the stern. Below on a horizontal yellow ribbon is SUMMERSIDE in black letters; above it is a smaller arched yellow ribbon with CITY in smaller black letters; below it is a small yellow rectangle with INC. 1995 in even smaller black letters. In the black space below "City" is "of" in yellow. At the base is a green rectangular ribbon inscribed PRINCE EDWARD ISLAND in black. All letters are serif Courier font. 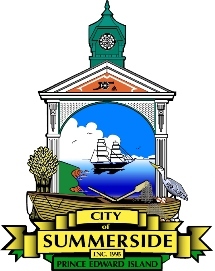 The City of Summerside was incorporated 1 April 1995 through the amalgamation of the Town of Summerside, the Village of St. Eleanors, the Village of Wilmot, and a portion of the Community of Sherbrooke. The city shield derives from the coat of arms of the city, and includes items which refer to the culture, industry, and heritage of those amalgamated communities. Summerside is represented by its city hall’s clock tower. The gable is of the style prevalent on older homes in the Summerside area. The cannon represents the cenotaphs in Summerside and in St. Eleanors (and Earl Cannon, the first chairman of St. Eleanors). It also recalls the military history of both communities, the armouries in the old town, and the Canadian Forces Base at St. Eleanors. The arch and pillars represent the Victorian style of many older structures in the city, and suggest unity through strength. The sailing ship passing the shores of Prince Edward Island recalls the role of the maritime trade in Summerside’s history and shipping potatoes around the world. The wheat sheaf represents the farming industry prevalent in Sherbrooke, Wilmot, and St. Eleanors before their urbanization. The fishing dory shows the strong link of the community to the sea—a common sight today is an oysterman in his dory working the Wilmot River. The heron, whose favourite haunt is the Wilmot River, represents the community of Wilmot. The flag was selected in a contest conducted in the spring of 1995 when residents of the city submitted their designs. 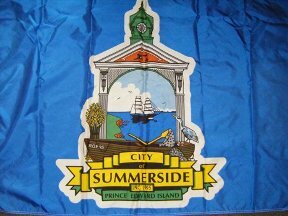 The city emblem and flag were introduced upon the incorporation of the City of Summerside. Unknown. Richard G. Fortin designed the emblem. Summerside previously used a flag in 1:2 proportions and a blue field, bearing a device in the centre nearly the full height of the flag. In it a shield depicts a naturalistic scene of land, sea, mountains, cloud-filled sky, and a ship with a single mast and no sail, flying a pennant; on the land is a prominent sheaf of wheat, all of these in white, yellow, light blue, and black. Above the shield is a ribbon in golden yellow inscribed SUMMERSIDE in black serif letters, below is a similar ribbon inscribed PRINCE EDWARD ISLAND in slightly smaller letters. The ends of the ribbons pass behind the shield. The entire device is outlined in white.